After almost a week of false reports and inaccurate details on the situation, WWE.com has confirmed that Hall of Famer Mae Young has passed away at age 90. Mae has to be one of the most unique superstars from the Attitude Era being she was in her 70s at the time she was involved in the memorable moments many of today’s fans remember most. Many may not realize, but Johnnie Mae Young had been a pro wrestler since the 30s, and was in many ways a pioneer who paved the way for women to be involved in pro wrestling. 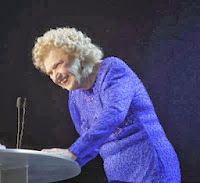 Even though Mae Young had been used for mostly comedic purposes in her latter wrestling appearances, the things she did in the ring during the Attitude Era were pretty amazing. Not only did Mae participate in matches alongside her regular partner The Fabulous Moolah (R.I.P.) and took on the current Divas of the time, but Mae was also known for extreme moments such as taking a powerbomb through a table from the Dudley Boys – a stunt that will likely never be seen again by someone in their 70s. While some may remember the crazy stories Mae was involved in such as stripping at the 2000 Royal Rumble or giving birth to a hand, Mae was a true old school wrestler that even trained males to wrestle. Mae is also the only wrestler to have wrestled matches in 9 different decades, with her last match occurring in 2010 on RAW. Mae Young made an impression on an entirely new generation during the Attitude Era and had a run that most wrestlers in their 70s or older would never dream of. She was able to shine even though she was paired with one of the most recognizable womens stars in WWE history in The Fabulous Moolah. To truly appreciate Mae one would have to watch some of her old matches and experience how brutal of a competitor she truly was. The Shield vs. The Wyatt Family: Which Trio Will Dominate WWE?